Answer: Weeping or curdling occurs when egg mixtures are cooked too fast or too long. The proteins over coagulate, then separate from each other leaving little Miss Muffet's curds and whey. 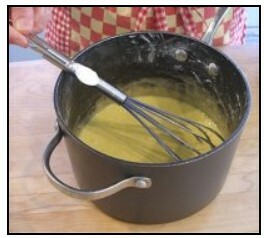 To fix custard with lumps, use an immersion blender. A quick pulse with it will effectively break them down, restoring to a desired creamy texture, even when refrigerated. If lumps are starting to form during the making of your recipe, remove the custard from the stove and immediately pour it into a bowl. Pulse the mixture with an immersion blender for about 30 seconds, taking care not to over process, otherwise you will thin the mixture. Process the custard through a fine mesh strainer, to remove any remaining lumps, back into a clean pot and continue cooking your recipe.